The beauty of some, like Ya Karim (The Most Generous One) or Ya Wadud (The Infinitely Loving One) is easy to grasp. Others like Ya Qabid and Ya Basit, are trickier because they express the fluctuation between opposites. Along with pairs like The Abaser (Al-Khafid) and the Exalter (Ar-Rafi) or The Bestower of Honour (Al-Muizz) and The One Who Humbles (Al-Mudhill), they remind us that Divinity encompasses all human states, pretty and ugly alike. At first, this realization shook me. I’d spent a long time unconsciously leaning on spiritual practice to avoid facing and healing unresolved emotional pain and psychological wounding, falling into the dreaded traps of spiritual bypassing. Hiding behind a veneer of positivity was easier for me than peeking at the difficult emotions dwelling just beyond the thin veil I pretended wasn’t there. My relationship with suffering has changed with the understanding that in order to live my highest truth, I need to dive into the wounding that separated me from innermost heart in the first place. That’s meant engaging with some raw pain that’s been with me since I was a little girl who didn’t feel worthy of unconditional love. She’s the part of me that tends to seek perfection because she believes without it she won’t be loved. Fearful of being rejected if she expresses her voice, she chooses silence over authenticity. Admitting these and other truths, let alone allowing myself to feel them, has been challenging. But only when the torment of these wounds is felt deeply and held lovingly can the spiritual healing offered by Sufism genuinely unfold. 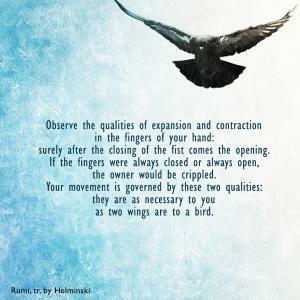 Reading Rumi, we often come across the imagery of humans being akin to diamonds or rubies at our core, that is, our highest potentiality. Mining these valuable gems from the Earth requires drilling through layers of hard rock that settled over centuries and, frankly, are impossible to move without heavy machinery. Similarly, the inward spiritual journey demands burrowing through the embedded beliefs forced onto my psyche by family, religion and society that are blocking the radiance of my truest self. So, like a miner, I drill. It’s painful and yet I instinctively know that even in the depths of agony, I’m not alone. 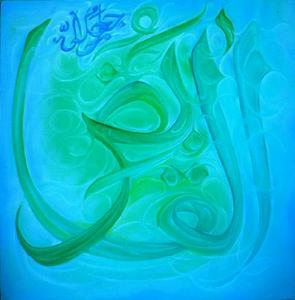 I’m aware of the Divine Quality Ya Rahman, the Infinitely Compassionate One, holding the pain with me. The Arabic word Rahman derives from the same root as the word womb. When I learned this a couple of years ago, I began to conceive of God as a Loving Womb connected to all of creation with an invisible umbilical cord, holding each of us in all of our states. Feeling attached to Ya Rahman at my core has given me the courage to be vulnerable enough to sink into the mine shaft of my psyche. Surrendering to Ya Qabid, I know I’m being guided through my wounding to the ruby nature that lies beneath, so I’m less distracted or irritated by the anguish of the journey. Rather, the pain I feel and the tears I shed have a strange sweetness to them now. The Quranic promise, with every difficulty comes ease**, rings in my ears. O traveler, it’s for your own good. Thank you for this enlightening ideas..for this beautiful blog also…where i always find a lot of comfort and peace..